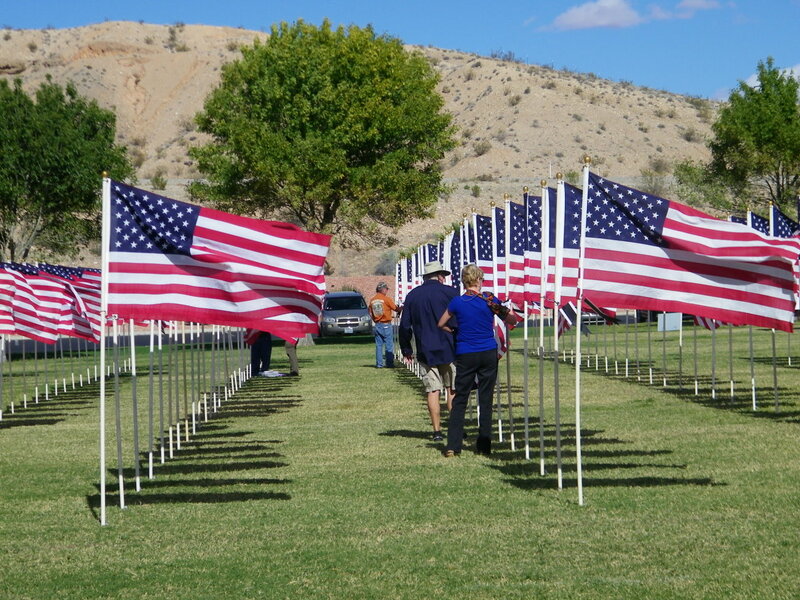 MESQUITE, Nev. – The Exchange Club of Mesquite is inviting the public be part of a Mesquite tradition as they present the 13th annual “One Thousand Flags Over Mesquite” tribute to the military and veterans starting Sunday and running through Veterans Day. The field of 1,000 American flags will be assembled on the west field of the Mesquite Recreation Center on Sunday morning and will stand until Nov. 11, rain or shine, according to a press release from the Exchange Club of Mesquite. The field will also be lit at night, and volunteers from the community will maintain a watchful vigil at the field throughout the event. Help from young and old alike is welcome in setting up the field at 9 a.m. on Sunday. “Visit the field – once or often,” the press release reads. A ceremony will be held Nov. 11 at 2 p.m. during which the Mesquite Fire Department will conduct the flag retirement. Anyone with a worn or weathered American Flag in need of retirement can bring it to the field anytime during the week. The Exchange Club of Mesquite is a major supporter of local veterans’ programs and services in the Virgin Valley, and the One Thousand Flags Over Mesquite event is a primary fundraiser. Members of the public are invited to sponsor a flag for $35, and will be given a ribbon of remembrance to attach to the flag in honor of or in memory of an important veteran in their lives. Following the closing ceremony the public is welcome to either take the flag they sponsored home to display or donate it back to the project to be included in next year’s event. For more information, call 702-377-1465 or visit the event’s website here.